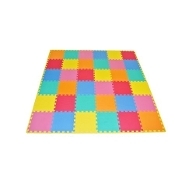 Bright primary colors to stimulate your baby's early child development, the interlocking foam mat, when assembled as shown, is 6 ft by 6 ft, 3/8 in thick. Great play area for babies and children. Colors and styles may vary.